The European Space Agency (ESA) is set to test launch the Intermediate Experimental Vehicle (IXV) – a 16-foot, two-ton, wingless “space plane” which could help pave the way for reusable spacecraft. Shaped like a cone to facilitate reentry, IXV’s mission is to better understand “the interaction between environmental pressures and the structural components of the space vehicle,” ESA said in a statement. It will also test new materials to avoid burning up during reentry. "We are able to go [to space], we are able to stay in orbit, what we want to learn today is to close the loop, to return from orbit, and this is one of the most complex disciplines in space activity," IXV program manager Giorgio Tumino told AFP. IXV is scheduled to be launched into space on a Vega rocket from a space pad in Kourou, French Guiana, at 13:00 GMT on Wednesday. If all goes according to plan, it is expected to separate from Vega’s protective fairing at an altitude of 320 km, some 18 minutes after liftoff. IXV will then ascend to an altitude of roughly 450 km, before it plummets to the ground at several times the speed of sound, recording data throughout the course of its descent. Once it reaches an altitude of 120 km, its entry speed will be 7.5 km/s, where it will face temperatures of over 1,600 Celsius, creating the same conditions as those of a vehicle returning from low orbit. A parachute will eventually be deployed to slow the rate of descent. Balloons will be used to keep the craft afloat once it touches down in the Pacific Ocean, where it will be recovered for further analysis. "Today we have our astronauts flying in Russian capsules, if one day we want them with the capability to fly back with European technology, this is fundamental," Tumino said. 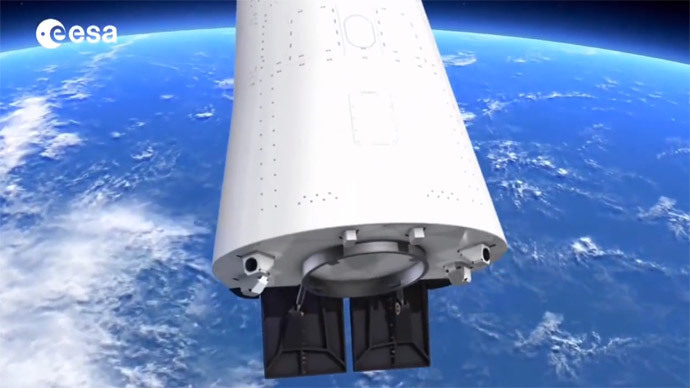 Boeing and SpaceX are also attempting to develop reusable astronaut carriers for NASA. In January, SpaceX successfully launched a Falcon9 rocket on a restocking mission to the International Space Station (ISS). An attempt to land the potentially reusable rocket on a barge, however, failed.